If you think that the VEK is only capable of providing you of enough alcohol and the subsequent hangover, then you’re totally wrong. Also on a cultural level, we can offer you a lot of activities. To give you an idea of all the activities, we will give you some details about them. To improve you’re I.Q the VEK organizes the VEK Quiz. There will be battled for the title of “smartest team of the faculty”. You’re knowledge will be tested on different subjects so everyone gets his/her time to shine. To take your gastronomic knowledge to a higher level, we organise a barbeque that takes place at the faculty. This is the perfect opportunity to get to know new people. 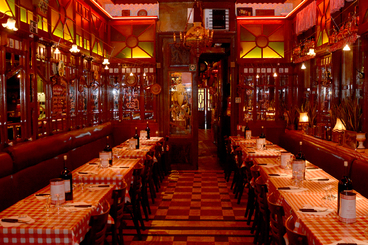 We also organize a rib evening at the famous “Amadeus”. The one who can eat the most ribs, will be rewarded at the Yucca! Of course this can’t lack our gamma. In the beginning of the academic year the pub crawl for the first year students takes place. This is the best way to discover the famous “overpoort” and each other. Ghent has more to offer than “de overpoort” only. So we’re going to discover the citycenter on our Lissabon, Portugal “old Ghent” pub crawl. To close our pub crawls season we go and visit Leuven and all it’s pubs. Is dit allemaal niets voor jou? Geen nood, ons gamma aan activiteiten is nog lang niet uitgeput. We organiseren een filmavond en een pokertornooi, waar je jouw pokerface ten volle zal kunnen gebruiken. We sluiten ons assortiment af met een ladies & men’s night waarbij het eens niet gaat om het andere geslacht te entertainen. Wij zullen jullie voorzien van alles wat nodig is voor een echte mannenavond en een echte girlsnight. Als je nu eenmaal super goed bent in het andere geslacht imponeren, kom dan zeker naar onze speeddate waar je jouw beste versiertrucs kan showen.